I don’t think it is any surprise for anyone in the biking blogging world to learn that Australia has mandatory helmet laws for cyclists, that Australia is somewhat mocked for those laws and that the lack of success of bike share schemes in Melbourne and Brisbane is attributed to the same laws. The helmet law here is enforced, and apparently raises a great deal of revenue. It also gets challenged in court and I know one person who has successfully taken this matter to court and won on the grounds he does not want to risk a rotational head injury from wearing a helmet. So it comes as a bit of a revelation, to me at least, that lately there does not seem to be a lot of helmet wearing going on in inner Newcastle. Now this is based on my somewhat limited observations when I make trips into town or the inner suburbs. 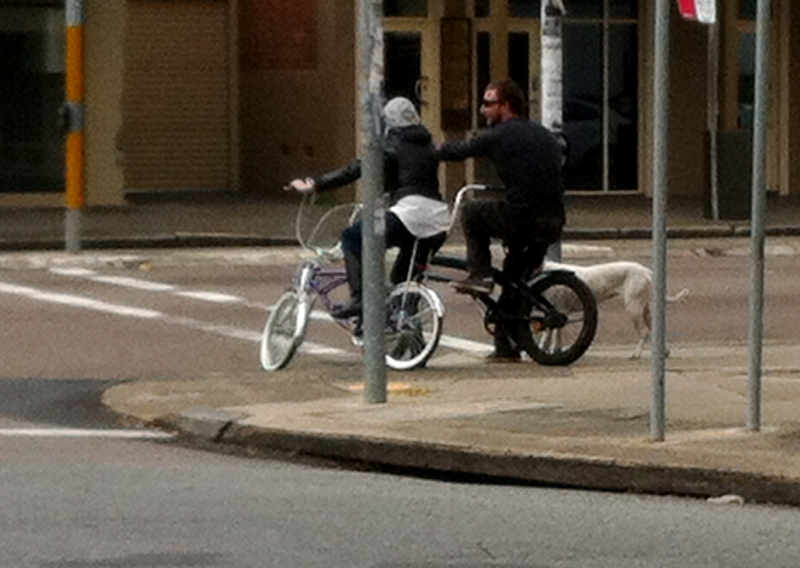 And when I looked through my files I found a large number of photos of street cyclists not wearing helmets. Yet, and again based on my no doubt limited observations, when I ride Fernleigh, it seems that everyone wears a helmet, no doubt partly because they are often road cyclists who ride fast, but even the recreational cyclists wear helmets there. I would guess that there is less reason to wear a helmet on a shared path like Fernleigh than in the inner city traffic, but there you have it. Me, I wear a helmet most of the time, just in case. My helmets are not that new or great quality but they stop me from getting booked and may save my head in case of an accident. Sometimes I don’t wear one if I forget to wear it or if the weather is just too hot, and the only time I have had anyone yell at me for that was on Fernleigh when the track was nearly empty, when I have ridden down Beaumont Street in heavy traffic helmetless and had no comment, go figure. NB: I have not posted often lately due to yet another bout of winter illness, hopefully normal transmissions will resume soon. This entry was posted in Uncategorized and tagged about me, Beaumont St, Fernleigh, helmets, newcastle, street cyclists, Trendy bike, women on bikes. Bookmark the permalink. Thanks for your good wishes Brenda. I know helmet wearing is controversial and I don’t fully support helmets, I really only wear mine because of the law here and the “just in case” factor too. Thanks Greg. I agree there is a great feeling of freedom when riding helmet less. I may do it more often this summer. Would you believe it ? I rode into town today helmetless via Fernleigh, but I did have my strapless reinforced safety beret on (lol) and that was before I read this post ! P.S. It looks like a helmet from a distance … teehee. Peter, someone told me that helmets are not mandatory on Fernleigh, but I am not sure about that, I must check the signage next time I am there to see if it indicates anything re helmet wearing. I’m a bit naughty and often go without mine. I have been stopped by the police a few times, but, have been lucky enough to enjoy a lovely chat and go on my way without a fine. An acquaintance mentioned only a couple of days ago that they were fined $150 for not having a helmet or lights/reflectors. Hope you’re firing on all cylinders soon, take care. I saw a blog-docco about the helmet laws in Darwin. Apparently there you are allowed to go helmet less on bike paths and shared paths. The hypothesis is that this law means more cyclists as they feel more comfortable in the heat and can choose headwear options to protect from other dangers ie the sun. BB, I think gettIng fined can be a matter Of attitude. I never get fined when I am pulled over by the police, but I have had a few camera fines for speeding. Jess, that is good that some states are finally recognising that helmets are not the headwear of choice in all situations, I wish they would give users of bike share bikes that choice! Those guidelines make for very interesting reading Greg. They raise a few questions in my mind. I think I will do a future post on some of them! Wouldn’t you still have to carry the helmet to access the shared path. Putting on and off would irritate me. Here in the UK when they brought in the law of helmet wearing for motorcyclists, they had to make exceptions for Religious groups who wear turbans. Mind I have never ever seen anyone wear a turban on a motorcycle but probably they might in London.